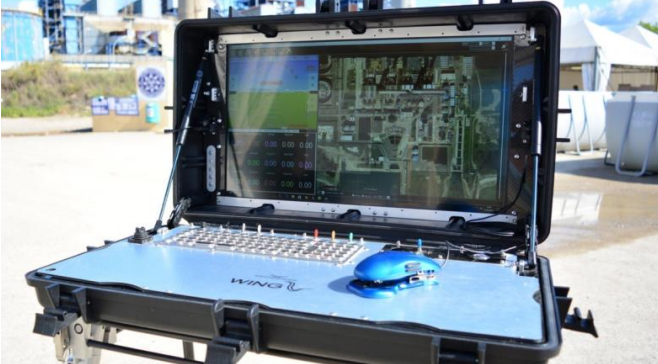 Unmanned Aerial Vehicles (UAVs or drones) are now reasonably well established in a number of areas including inspection, mapping, and search and rescue. In some situations it would be beneficial to simultaneously operate a swarm of multiple aircraft. 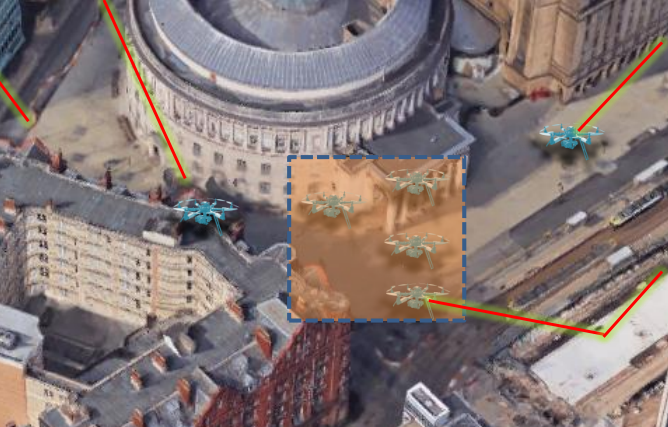 While there have been demonstrations of swarms involving up to 1000 UAVs, there are few examples of use in practical scenarios. It is possible that one reason for this is the difficulty of effectively organising and controlling the swarm using a standard transmitter and laptop computer. An alternative approach to commanding and controlling a swarm using the Wing control device is presented here. 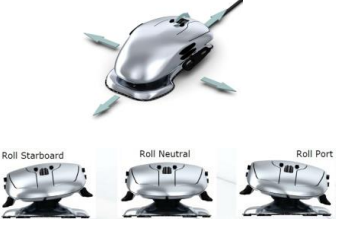 The Wing, shown in Figure 1a, is a 6-axis control device that combines full three-dimensional (3D) control with the precision of a laser mouse. 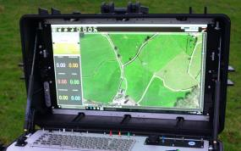 Current uses include control of single UAVs, and use with Computer Aided Design (CAD) computer visualisation software. The Wing GCS, shown in Figure 1b, was developed around the Wing control device to enable manual piloting and mission planner control with one hand. The other hand is then free to operate aircraft systems and camera gimbal through the keyboard and secondary joystick. Further details are described at worthingtonsharpe.com. 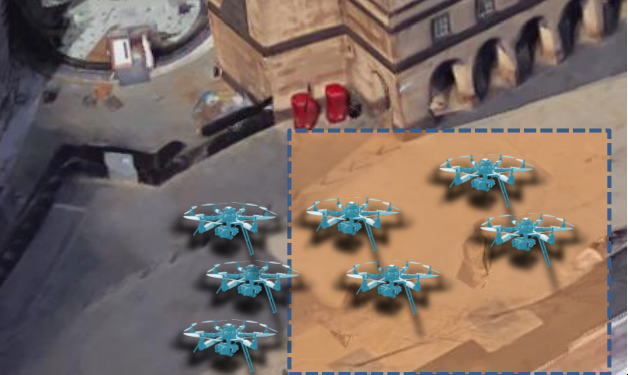 A total re-design of the current Wing GCS is proposed to create a new Swarm Control Station (Wing SCS). The internal computer and telemetry systems will need to be specified and integrated to meet the needs of multiple aircraft. Developments will also be required to increase the robustness and make the system suitable for use in all weather conditions. The Wing will still be used as the primary input device. In addition to the work on the ground control station hardware, it will be necessary to modify the ground station software program to work optimally with the new human interface. 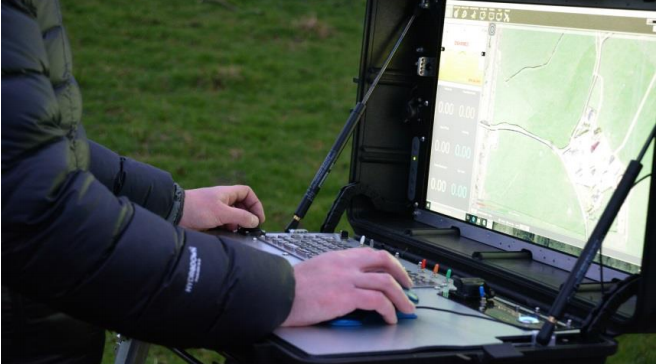 Other work will include developing or integrating swarming algorithms, modifying the UAVs and flight control system as required, and optimising the systems and sensors to meet the objectives of a specific operational task. The features of the current Wing GCS and how they might be applied to the command and control of multiple UAVs are described in the table below. 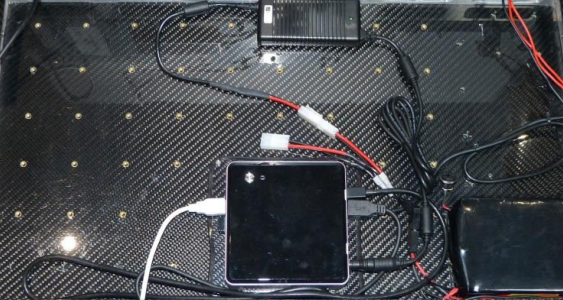 It is likely the new Wing SCS design would be based on a similar hardware layout. The Wing incorporates a high resolution mouse sensor and standard mouse buttons and scroll wheel. This is ideal for point-and-click tasks. Alternative input methods such as touch-screens suffer from a lack of precision, user fatigue, and problems with unintentional command input. 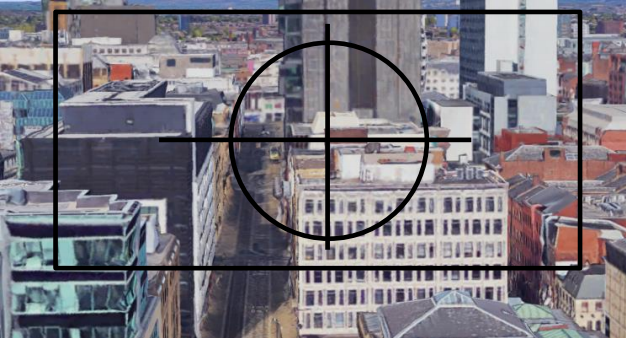 Display is much larger than most UAV ground station displays and is ideal means it can be used for accurate waypoint manipulation, First Person View (FPV) from the on-board camera and detailed checking of aerial footage and data both during and post-flight. The screen’s brightness and large viewing angle make it practical to use even in direct sunlight, typically a major problem with a conventional laptop or tablet computer. 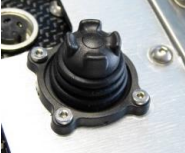 An integrated secondary joystick enables independent control of the camera gimbal or panning the map view. The full-sized waterproof keyboard provides usability similar to a desktop computer. A six-position rotary switch can be configured for changing flightmodes and six three-position switches are fitted for userdefinable functions. Space is available for multiple aircraft telemetry systems and RealTime Kinematic (RTK) systems. In order to illustrate the potential benefits, a number of different mission planner and piloting operations are presented and discussed in the following table. 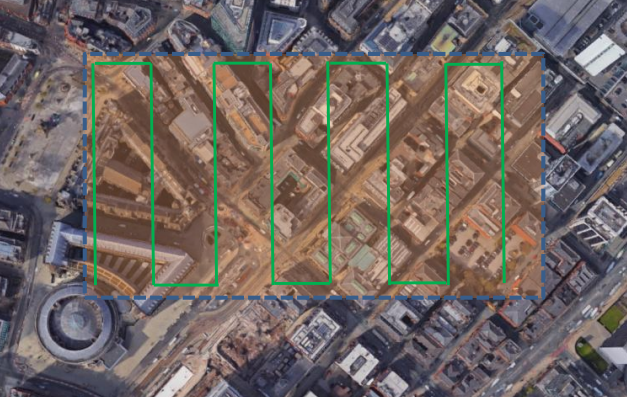 Mouse functions can be used to define a boundary for a simple grid search pattern. Keyboard short-cuts or the scrollwheel can be used to define grid spacing. The numeric keypad can be used to set altitude. Mouse functions can be used to quickly select a group of aircraft. Right-button menu or keyboard shortcut to assign commands. 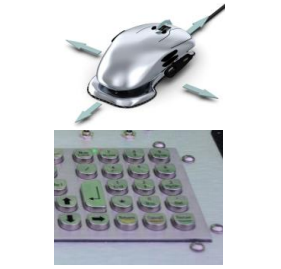 Mouse functions offer necessary precision and speed for selecting aircraft and assigning different waypoints. 24” screen allows large area to be displayed in detail. Pitch, roll & yaw functions or secondary joystick used for view manipulation. 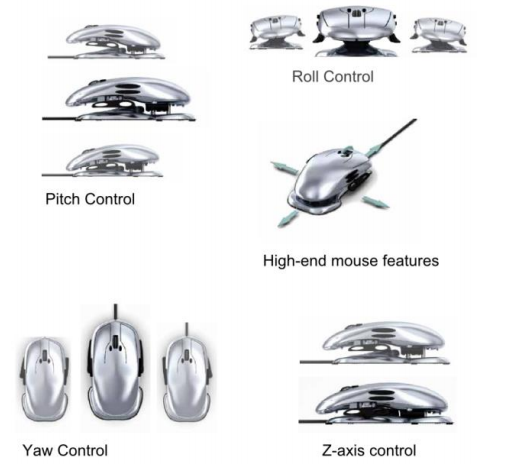 The mouse functions can be used to select an individual aircraft then pitch roll yaw and throttle functions used to pilot lead aircraft. All this can be done without having to change input devices. Secondary joystick for gimbal control of selected aircraft. Keyboard short-cuts to rapidly assigning aircraft formations or search altitude.